Are you done watching it? Good. Go watch it again. Why aren't you downloading this already? Oh, you want some explanation? Okay, here's how it works: you're a monkey. I know, dream come true, right? Prehensile tail, opposable thumbs on your feet, the whole shebang. 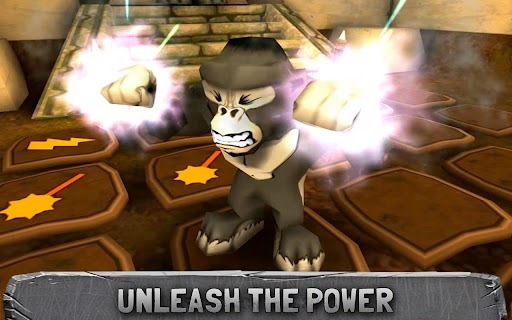 You're on an arena floor with four other apes. The floor is divided into tiles. Each turn, you choose which tile to jump on to. As you jump, various powerups slide down the grid. You choose not where the powerup you're aiming for is, but where it will be. As are your opponents. Depending on where you (and they) land, you may replenish your health, take a shot at your enemies with a shotgun, blow them up, poison them, pick up a mace to beat them senseless, or get burned by lava. Oh, I see you've stopped listening to go download this game. About time. I'll wait. 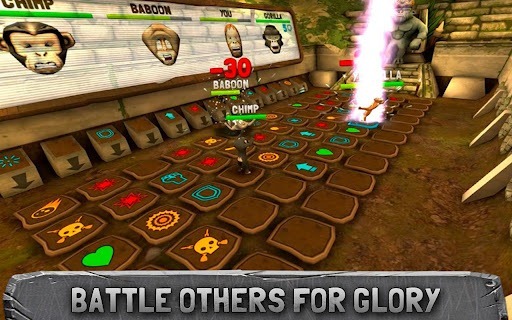 The game is free to play, but does use in-app purchases to support itself. Thankfully, the purchases are non-essential. 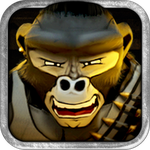 During the game you earn coins, but in order to unlock new apes, costumes, dances, and other fun bits, you have to spend a combination of coins and gems on the items. Gems can only be purchased from the Play Store or earned by completing affiliate tasks like signing up for Netflix or downloading a promoted app. 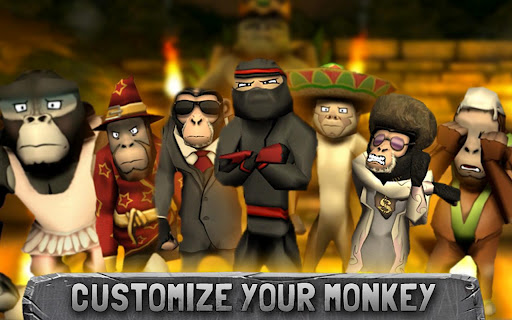 No one would fault you for not buying gems, but it would at least be a nice gesture to the developers who have made it possible for us to do what we've always wanted: force monkeys to battle for our own amusement. *Note: Most of the depicted mammals are actually apes. But "monkey" is a much funnier word, so that's what we're using. Deal with it.